The Federal Aviation Administration has named an aviation arrival procedure into Nashville after Kenny Chesney. The CHSNE TWO arrival brings aircraft into the Nashville International Airport from the southwest, and includes the waypoints CHSNE, TIKKI, GDSTF, and BGSTR (aviation waypoints/intersections are always five letters). So if you’re on an airliner coming into Nashville from the southwest, you just may be flying the CHSNE TWO arrival! How cool is that?! There are also arrival procedures named after Brad Paisley (PASLY THREE) and Taylor Swift (SWFFT TWO), and departure procedures named after Merle Haggard (HGGRD TWO), Dolly Pardon (PARDN TWO), and apparently Aaron Tippin (TIPPN TWO). Kenny Chesney dropped by ESPN’s Mike & Mike Show on Friday morning and while he was on, New Orleans Saints coach Sean Payton called in. Did you miss Kenny Chesney on The Tonight Show with Jimmy Fallon on Wednesday night? The 50th annual ACM Awards aired Sunday night from Arlington, Texas and Kenny Chesney performed two songs and was awarded with one of the night’s Milestone Awards. Be sure to tune into the Academy of Country Music Awards show tonight at 8 PM ET on CBS. Hosted by Luke Bryan and Blake Shelton, the night marks the 50th anniversary of the ACMs. Chesney will also perform and be honored with a milestone award. A slew of big acts will also perform, including Garth Brooks, Luke Bryan, Miranda Lambert, Jason Aldean, Reba McEntire, Blake Shelton, George Strait, Eric Church, Keith Urban and Florida Georgia Line. Kenny Chesney has launched a video series on Youtube entitled “No Shoes TV” that will cover each of the big shows on The Big Revival Tour. Now he launches No Shoes TV, a quick-hit round-up of the best moments at this year’s The Big Revival Tour’s major stadiums shows. Correspondent Deanna Kay will catch up with the No Shoes Nation in the parking lot, on the road, in the stands and anywhere she thinks there’s a moment to capture. Deanna will also be a ticket source. During tour stops, she will hide tickets, leaving clues via social media (on the No Shoes Nation’s Twitter, Instagram, and Facebook) to give fans the opportunity to have scavenger hunt fun and get upgraded, as well as rewarding people with the best stories some of the coveted wristbands for the GA area down front. 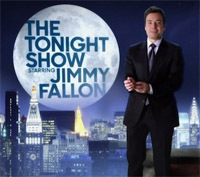 Next week Kenny Chesney will drop into New York City for an appearance on The Tonight Show with Jimmy Fallon. Kenny will be the musical guest on Wednesday, April 22nd and may sit for a short interview as well. Other guests that night include actor Russell Crowe and New Jersey governor and likely presidential candidate Chris Christie. On the 23rd, Chesney plays a show at the Times Union Center in Albany, New York. View the full tour schedule.